The Views of Naperville is designed to exceed your expectations. We offer one and two bedroom apartments for rent in Naperville, IL, with spacious open floor plans and incomparable views. For those of you seeking even more space, our two bedrooms plus den apartment gives you the opportunity to create a home office, library, craft, or personal yoga and meditation room. You will love our renovated floor plans featuring luxuriously appointed kitchens with granite countertops complimented by mosaic tile backsplashes. We also supply you with attractive stainless steel appliances. Try our neighboring community Windscape of Naperville Apartments. The Views of Naperville is here to offer you upscale amenities at an affordable rate. 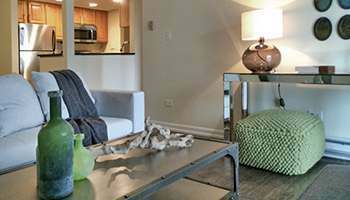 All of our apartments come with standard and upgraded features including air conditioning, built-in microwave, private patio or balcony, and ceiling fan. Select homes include lake and fountain views, wood-burning fireplace, and den. With five spacious floor plans to choose from, you will find the ideal apartment home to suit your lifestyle. Are you ready to call The Views of Naperville home? Contact our leasing office today to schedule a tour and learn more about our beautiful apartments for rent in Naperville, IL.